Chlorofluorocarbons (CFCs) are fully halogenated paraffin hydrocarbons that contain only carbon (C), chlorine (Cl), and fluorine (F), produced as volatile derivative of methane, ethane, and propane. They are also commonly known by the DuPont brand name Freon. The most common representative is dichlorodifluoromethane (R-12 or Freon-12). Many CFCs have been widely used as refrigerants, propellants (in aerosol applications), and solvents. Because CFCs contribute to ozone depletion in the upper atmosphere, the manufacture of such compounds has been phased out under the Montreal Protocol, and they are being replaced with other products such as hydrofluorocarbons (HFCs) (e.g., R-410A) and R-134a. As in simpler alkanes, carbon in the CFCs bonds with tetrahedral symmetry. Because the fluorine and chlorine atoms differ greatly in size and effective charge from hydrogen and from each other, the methane-derived CFCs deviate from perfect tetrahedral symmetry. The physical properties of CFCs and HCFCs are tunable by changes in the number and identity of the halogen atoms. In general, they are volatile but less so than their parent alkanes. The decreased volatility is attributed to the molecular polarity induced by the halides, which induces intermolecular interactions. Thus, methane boils at −161 °C whereas the fluoromethanes boil between −51.7 (CF2H2) and −128 °C (CF4). The CFCs have still higher boiling points because the chloride is even more polarizable than fluoride. Because of their polarity, the CFCs are useful solvents, and their boiling points make them suitable as refrigerants. The CFCs are far less flammable than methane, in part because they contain fewer C-H bonds and in part because, in the case of the chlorides and bromides, the released halides quench the free radicals that sustain flames. The densities of CFCs are higher than their corresponding alkanes. In general, the density of these compounds correlates with the number of chlorides. The chlorine atom, written often as Cl., behaves very differently from the chlorine molecule (Cl2). The radical Cl. is long-lived in the upper atmosphere, where it catalyzes the conversion of ozone into O2. Ozone absorbs UV-B radiation, so its depletion allows more of this high energy radiation to reach the Earth's surface. Bromine atoms are even more efficient catalysts; hence brominated CFCs are also regulated. CFCs and HCFCs are used in a variety of applications because of their low toxicity, reactivity and flammability. Every permutation of fluorine, chlorine and hydrogen based on methane and ethane has been examined and most have been commercialized. Furthermore, many examples are known for higher numbers of carbon as well as related compounds containing bromine. Uses include refrigerants, blowing agents, propellants in medicinal applications and degreasing solvents. Billions of kilograms of chlorodifluoromethane are produced annually as precursor to tetrafluoroethylene, the monomer that is converted into Teflon. Chlorofluorocarbons (CFCs): when derived from methane and ethane these compounds have the formulae CClmF4−m and C2ClmF6−m, where m is nonzero. Hydro-chlorofluorocarbons (HCFCs): when derived from methane and ethane these compounds have the formula CClmFnH4−m−n and C2ClxFyH6−x−y, where m, n, x, and y are nonzero. and bromofluorocarbons have formulae similar to the CFCs and HCFCs but also include bromine. Hydrofluorocarbons (HFCs): when derived from methane, ethane, propane, and butane, these compounds have the respective formulae CFmH4−m, C2FmH6−m, C3FmH8−m, and C4FmH10−m, where m is nonzero. A special numbering system is to be used for fluorinated alkanes, prefixed with Freon-, R-, CFC- and HCFC-, where the rightmost value indicates the number of fluorine atoms, the next value to the left is the number of hydrogen atoms plus 1, and the next value to the left is the number of carbon atoms less one (zeroes are not stated), and the remaining atoms are chlorine. Freon-12, for example, indicates a methane derivative (only two numbers) containing two fluorine atoms (the second 2) and no hydrogen (1-1=0). It is therefore CCl2F2. Another equation that can be applied to get the correct molecular formula of the CFC/R/Freon class compounds is this to take the numbering and add 90 to it. The resulting value will give the number of carbons as the first numeral, the second numeral gives the number of hydrogen atoms, and the third numeral gives the number of fluorine atoms. The rest of the unaccounted carbon bonds are occupied by chlorine atoms. The value of this equation is always a three figure number. An easy example is that of CFC-12, which gives: 90+12=102 -> 1 carbon, 0 hydrogens, 2 fluorine atoms, and hence 2 chlorine atoms resulting in CCl2F2. The main advantage of this method of deducing the molecular composition in comparison with the method described in the paragraph above is that it gives the number of carbon atoms of the molecule. Carbon tetrachloride (CCl4) was used in fire extinguishers and glass "anti-fire grenades" from the late nineteenth century until around the end of World War II. Experimentation with chloroalkanes for fire suppression on military aircraft began at least as early as the 1920s. Freon is a trade name for a group of CFCs which are used primarily as refrigerants, but also have uses in fire-fighting and as propellants in aerosol cans. Bromomethane is widely used as a fumigant. Dichloromethane is a versatile industrial solvent. The Belgian scientist Frédéric Swarts pioneered the synthesis of CFCs in the 1890s. He developed an effective exchange agent to replace chloride in carbon tetrachloride with fluoride to synthesize CFC-11 (CCl3F) and CFC-12 (CCl2F2). In the late 1920s, Thomas Midgley, Jr. improved the process of synthesis and led the effort to use CFC as refrigerant to replace ammonia (NH3), chloromethane (CH3Cl), and sulfur dioxide (SO2), which are toxic but were in common use. In searching for a new refrigerant, requirements for the compound were: low boiling point, low toxicity, and to be generally non-reactive. In a demonstration for the American Chemical Society, Midgley flamboyantly demonstrated all these properties by inhaling a breath of the gas and using it to blow out a candle in 1930. During World War II, various chloroalkanes were in standard use in military aircraft, although these early halons suffered from excessive toxicity. Nevertheless, after the war they slowly became more common in civil aviation as well. In the 1960s, fluoroalkanes and bromofluoroalkanes became available and were quickly recognized as being highly effective fire-fighting materials. Much early research with Halon 1301 was conducted under the auspices of the US Armed Forces, while Halon 1211 was, initially, mainly developed in the UK. By the late 1960s they were standard in many applications where water and dry-powder extinguishers posed a threat of damage to the protected property, including computer rooms, telecommunications switches, laboratories, museums and art collections. Beginning with warships, in the 1970s, bromofluoroalkanes also progressively came to be associated with rapid knockdown of severe fires in confined spaces with minimal risk to personnel. By the early 1980s, bromofluoroalkanes were in common use on aircraft, ships, and large vehicles as well as in computer facilities and galleries. However, concern was beginning to be expressed about the impact of chloroalkanes and bromoalkanes on the ozone layer. The Vienna Convention for the Protection of the Ozone Layer did not cover bromofluoroalkanes as it was thought, at the time, that emergency discharge of extinguishing systems was too small in volume to produce a significant impact, and too important to human safety for restriction. Since the late 1970s, the use of CFCs has been heavily regulated because of their destructive effects on the ozone layer. After the development of his electron capture detector, James Lovelock was the first to detect the widespread presence of CFCs in the air, finding a mole fraction of 60 ppt of CFC-11 over Ireland. In a self-funded research expedition ending in 1973, Lovelock went on to measure CFC-11 in both the Arctic and Antarctic, finding the presence of the gas in each of 50 air samples collected, and concluding that CFCs are not hazardous to the environment. The experiment did however provide the first useful data on the presence of CFCs in the atmosphere. The damage caused by CFCs was discovered by Sherry Rowland and Mario Molina who, after hearing a lecture on the subject of Lovelock's work, embarked on research resulting in the first publication suggesting the connection in 1974. It turns out that one of CFCs' most attractive features—their low reactivity— is key to their most destructive effects. CFCs' lack of reactivity gives them a lifespan that can exceed 100 years, giving them time to diffuse into the upper stratosphere. Once in the stratosphere, the sun's ultraviolet radiation is strong enough to cause the homolytic cleavage of the C-Cl bond. In 1978, under the Toxic Substances Control Act, the EPA banned commercial manufacturing and use of CFCS and aerosol propellants. This was later superseded by broader regulation by the EPA under the Clean Air Act to address stratospheric ozone depletion. 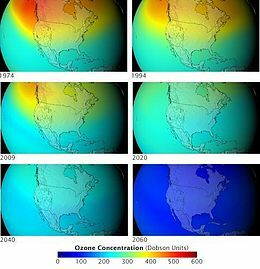 NASA projection of stratospheric ozone, in Dobson units, if chlorofluorocarbons had not been banned. Animated version. By 1987, in response to a dramatic seasonal depletion of the ozone layer over Antarctica, diplomats in Montreal forged a treaty, the Montreal Protocol, which called for drastic reductions in the production of CFCs. On 2 March 1989, 12 European Community nations agreed to ban the production of all CFCs by the end of the century. In 1990, diplomats met in London and voted to significantly strengthen the Montreal Protocol by calling for a complete elimination of CFCs by the year 2000. By the year 2010, CFCs should have been completely eliminated from developing countries as well. Because the only CFCs available to countries adhering to the treaty is from recycling, their prices have increased considerably. A worldwide end to production should also terminate the smuggling of this material. However, there are current CFC smuggling issues, as recognized by the United Nations Environmental Programme (UNEP) in a 2006 report titled "Illegal Trade in Ozone Depleting Substances". UNEP estimates that between 16,000–38,000 tonnes of CFCs passed through the black market in the mid-1990s. The report estimated between 7,000 and 14,000 tonnes of CFCs are smuggled annually into developing countries. Asian countries are those with the most smuggling; as of 2007, China, India and South Korea were found to account for around 70% of global CFC production, South Korea later to ban CFC production in 2010. Possible reasons for continued CFC smuggling were also examined: the report noted that many banned CFC producing products have long lifespans and continue to operate. The cost of replacing the equipment of these items is sometimes cheaper than outfitting them with a more ozone-friendly appliance. Additionally, CFC smuggling is not considered a significant issue, so the perceived penalties for smuggling are low. In 2018 public attention was drawn to the issue, that at an unknown place in east Asia an estimated amount of 13.000 metric tons annually of CFCs have been produced since about 2012 in violation of the protocol. While the eventual phaseout of CFCs is likely, efforts are being taken to stem these current non-compliance problems. By the time of the Montreal Protocol, it was realised that deliberate and accidental discharges during system tests and maintenance accounted for substantially larger volumes than emergency discharges, and consequently halons were brought into the treaty, albeit with many exceptions. While the production and consumption of CFCs are regulated under the Montreal Protocol, emissions from existing banks of CFCs are not regulated under the agreement. In 2002, there were an estimated 5,791 kilotons of CFCs in existing products such as refrigerators, air conditioners, aerosol cans and others. Approximately one-third of these CFCs are projected to be emitted over the next decade if action is not taken, posing a threat to both the ozone layer and the climate. A proportion of these CFCs can be safely captured and destroyed. In 1978 the United States banned the use of CFCs such as Freon in aerosol cans, the beginning of a long series of regulatory actions against their use. The critical DuPont manufacturing patent for Freon ("Process for Fluorinating Halohydrocarbons", U.S. Patent #3258500) was set to expire in 1979. In conjunction with other industrial peers DuPont formed a lobbying group, the "Alliance for Responsible CFC Policy," to combat regulations of ozone-depleting compounds. In 1986 DuPont, with new patents in hand, reversed its previous stance and publicly condemned CFCs. DuPont representatives appeared before the Montreal Protocol urging that CFCs be banned worldwide and stated that their new HCFCs would meet the worldwide demand for refrigerants. Bromofluoroalkanes have been largely phased out and the possession of equipment for their use is prohibited in some countries like the Netherlands and Belgium, from 1 January 2004, based on the Montreal Protocol and guidelines of the European Union. Production of new stocks ceased in most (probably all) countries in 1994. However many countries still require aircraft to be fitted with halon fire suppression systems because no safe and completely satisfactory alternative has been discovered for this application. There are also a few other, highly specialized uses. These programs recycle halon through "halon banks" coordinated by the Halon Recycling Corporation to ensure that discharge to the atmosphere occurs only in a genuine emergency and to conserve remaining stocks. The interim replacements for CFCs are hydrochlorofluorocarbons (HCFCs), which deplete stratospheric ozone, but to a much lesser extent than CFCs. Ultimately, hydrofluorocarbons (HFCs) will replace HCFCs. Unlike CFCs and HCFCs, HFCs have an ozone depletion potential (ODP) of 0. DuPont began producing hydrofluorocarbons as alternatives to Freon in the 1980s. These included Suva refrigerants and Dymel propellants. Natural refrigerants are climate friendly solutions that are enjoying increasing support from large companies and governments interested in reducing global warming emissions from refrigeration and air conditioning. Hydrofluorocarbons are included in the Kyoto Protocol because of their very high Global Warming Potential and are facing calls to be regulated under the Montreal Protocol[dubious – discuss] due to the recognition of halocarbon contributions to climate change. On 21 September 2007, approximately 200 countries agreed to accelerate the elimination of hydrochlorofluorocarbons entirely by 2020 in a United Nations-sponsored Montreal summit. Developing nations were given until 2030. Many nations, such as the United States and China, who had previously resisted such efforts, agreed with the accelerated phase out schedule. Work on alternatives for chlorofluorocarbons in refrigerants began in the late 1970s after the first warnings of damage to stratospheric ozone were published. The hydrochlorofluorocarbons (HCFCs) are less stable in the lower atmosphere, enabling them to break down before reaching the ozone layer. Nevertheless, a significant fraction of the HCFCs do break down in the stratosphere and they have contributed to more chlorine buildup there than originally predicted. Later alternatives lacking the chlorine, the hydrofluorocarbons (HFCs) have an even shorter lifetimes in the lower atmosphere. One of these compounds, HFC-134a, is now used in place of CFC-12 in automobile air conditioners. Hydrocarbon refrigerants (a propane/isobutane blend) are also used extensively in mobile air conditioning systems in Australia, the USA and many other countries, as they have excellent thermodynamic properties and perform particularly well in high ambient temperatures. Among the natural refrigerants (along with ammonia and carbon dioxide), hydrocarbons have negligible environmental impacts and are also used worldwide in domestic and commercial refrigeration applications, and are becoming available in new split system air conditioners. Various other solvents and methods have replaced the use of CFCs in laboratory analytics. In Metered-dose inhalers (MDI), a non-ozone effecting substitute was developed as a propellant, known as "hydrofluoroalkane." As previously discussed, CFCs were phased out via the Montreal Protocol due to their part in ozone depletion. However, the atmospheric impacts of CFCs are not limited to its role as an active ozone reducer. This anthropogenic compound is also a greenhouse gas, with a much higher potential to enhance the greenhouse effect than CO2. Infrared absorption bands trap heat from escaping earth's atmosphere. In the case of CFCs, the strongest of these bands are located in the spectral region 7.8–15.3 µm  – referred to as an atmospheric window due to the relative transparency of the atmosphere within this region. The strength of CFC bands and the unique susceptibility of the atmosphere, at which the compound absorbs and emits radiation, are two factors that contribute to CFCs' "super" greenhouse effect. Another such factor is the low concentration of the compound. Because CO2 is close to saturation with high concentrations,[clarification needed] it takes more of the substance to enhance the greenhouse effect. Conversely, the low concentration of CFCs allow their effects to increase linearly with mass. Because the time history of CFC concentrations in the atmosphere is relatively well known, they have provided an important constraint on ocean circulation. CFCs dissolve in seawater at the ocean surface and are subsequently transported into the ocean interior. Because CFCs are inert, their concentration in the ocean interior reflects simply the convolution of their atmospheric time evolution and ocean circulation and mixing. Chlorofluorocarbons (CFCs) are anthropogenic compounds that have been released into the atmosphere since the 1930s in various applications such as in air-conditioning, refrigeration, blowing agents in foams, insulations and packing materials, propellants in aerosol cans, and as solvents. The entry of CFCs into the ocean makes them extremely useful as transient tracers to estimate rates and pathways of ocean circulation and mixing processes. However, due to production restrictions of CFCs in the 1980s, atmospheric concentrations of CFC-11 and CFC-12 has stopped increasing, and the CFC-11 to CFC-12 ratio in the atmosphere have been steadily decreasing, making water dating of water masses more problematic. Incidentally, production and release of sulfur hexafluoride (SF6) have rapidly increased in the atmosphere since the 1970s. Similar to CFCs, SF6 is also an inert gas and is not affected by oceanic chemical or biological activities. Thus, using CFCs in concert with SF6 as a tracer resolves the water dating issues due to decreased CFC concentrations. Using CFCs or SF6 as a tracer of ocean circulation allows for the derivation of rates for ocean processes due to the time-dependent source function. The elapsed time since a subsurface water mass was last in contact with the atmosphere is the tracer-derived age. Estimates of age can be derived based on the partial pressure of an individual compound and the ratio of the partial pressure of CFCs to each other (or SF6). where F = solubility expressed in either mol l−1 or mol kg−1 atm−1, T = absolute temperature, S = salinity in parts per thousand (ppt), a1, a2, a3, b1, b2, and b3 are constants to be determined from the least squares fit to the solubility measurements. This equation is derived from the integrated Van 't Hoff equation and the logarithmic Setchenow salinity dependence. It can be noted that the solubility of CFCs increase with decreasing temperature at approximately 1% per degree Celsius. Once the partial pressure of the CFC (or SF6) is derived, it is then compared to the atmospheric time histories for CFC-11, CFC-12, or SF6 in which the pCFC directly corresponds to the year with the same. The difference between the corresponding date and the collection date of the seawater sample is the average age for the water parcel. The age of a parcel of water can also be calculated using the ratio of two CFC partial pressures or the ratio of the SF6 partial pressure to a CFC partial pressure. According to their material safety data sheets, CFCs and HCFCs are colorless, volatile, toxic liquids and gases with a faintly sweet ethereal odor. Overexposure at concentrations of 11% or more may cause dizziness, loss of concentration, central nervous system depression and/or cardiac arrhythmia. Vapors displace air and can cause asphyxiation in confined spaces. Although non-flammable, their combustion products include hydrofluoric acid, and related species. Normal occupational exposure is rated at 0.07% and does not pose any serious health risks. ^ "Climate Change." The White House. 6 August 2014. ^ Mironov, O. G. (1968). "Hydrocarbon pollution of the sea and its influence on marine organisms". Helgoländer Wissenschaftliche Meeresuntersuchungen. 17 (1–4): 335–339. Bibcode:1968HWM....17..335M. doi:10.1007/BF01611234. ^ Carlisle, Rodney (2004). Scientific American Inventions and Discoveries, p. 351. John Wiley & Songs, Inc., New Jersey. ISBN 0-471-24410-4. ^ Lee, Bing-Sun; Chiou, Chung-Biau (October 2008). 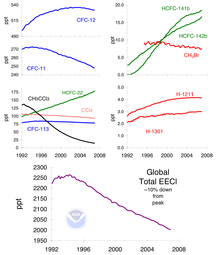 "The Relationship of Meteorological and Anthropogenic Factors to Time Series Measurements of CFC-11, CFC-12, and CH3CCl3 Concentrations in the Urban Atmosphere". Atmospheric Environment. 42 (33): 7707. Bibcode:2008AtmEn..42.7706L. doi:10.1016/j.atmosenv.2008.05.042. ^ Auer, Charles, Frank Kover, James Aidala, Marks Greenwood. “Toxic Substances: A Half Century of Progress.” EPA Alumni Association. March 2016. ^ "Illegal Trade in Ozone Depleting Substances" Archived 2012-03-22 at the Wayback Machine. United Nations Environmental Programme. 2007. Web. 3 April 2011. ^ "Ozonkiller: Ein verbotener Stoff in der Atmosphäre - WELT". Welt.de (in German). Retrieved 2018-05-18. ^ "Ozone hole-forming chemical emissions increasing and mysterious source in East Asia may be responsible". Independent.co.uk. Retrieved 2018-05-18. ^ Chlorofluorocarbons: An Overlooked Climate Threat, EESI Congressional Briefing Archived 2009-12-04 at the Wayback Machine. Eesi.org. Retrieved on 24 September 2011. ^ Desombre, E.R., 2000: Domestic Sources of International Environmental Policy: Industry, Environmentalists, and U.S. Power. MIT Press. SBN: 9780262041799. p. 93. ^ Welcome to the Halon Corporation Archived 2009-09-19 at the Wayback Machine. Halon.org. Retrieved on 24 September 2011. ^ a b Prinn, R. G.; Weiss, R. F.; Fraser, P. J.; Simmonds, P. G.; Cunnold, D. M.; Alyea, F. N.; O'Doherty, S.; Salameh, P.; Miller, B. R.; Huang, J.; Wang, R. H. J.; Hartley, D. E.; Harth, C.; Steele, L. P.; Sturrock, G.; Midgley, P. M.; McCulloch, A. (27 July 2000). "A History of Chemically and Radiatively Important Gases in Air Deduced from ALE/GAGE/AGAGE". Journal of Geophysical Research: Atmospheres. 105 (D14): 17751–17792. Bibcode:2000JGR...10517751P. doi:10.1029/2000JD900141. ISSN 2156-2202. ^ Freon® : 1930. In Depth Archived 2011-03-19 at the Wayback Machine. dupont.com (30 January 2009). Retrieved on 2011-09-24. ^ Broder, John M. (9 November 2010). "A Novel Tactic in Climate Fight Gains Some Traction". The New York Times. p. A9. Archived from the original on 20 May 2013. Retrieved 5 February 2013. ^ Velders, G. J. M.; Andersen, S. O.; Daniel, J. S.; Fahey, D. W.; McFarland, M. (2007). "The importance of the Montreal Protocol in protecting climate". Proceedings of the National Academy of Sciences. 104 (12): 4814–9. Bibcode:2007PNAS..104.4814V. doi:10.1073/pnas.0610328104. PMC 1817831. PMID 17360370. ^ HCFC Phaseout Schedule Archived 2009-07-16 at the Wayback Machine. Epa.gov (28 June 2006). Retrieved on 2011-09-24. ^ "Greenpeace, Cool Technologies" Archived 2008-07-06 at the Wayback Machine. (PDF). Retrieved on 24 September 2011. ^ Use of Ozone Depleting Substances in Laboratories. TemaNord 516/2003 Archived February 27, 2008, at the Wayback Machine. Norden.org (1 January 2003). Retrieved on 2011-09-24. ^ Boccuzzi, S. J; Wogen, J; Roehm, J. B (2000). "Use of hydrofluoroalkane propellant delivery system for inhaled albuterol in patients receiving asthma medications". Clinical Therapeutics. 22 (2): 237–47. doi:10.1016/S0149-2918(00)88482-9. PMID 10743983. ^ Rothman, L; Gordon, I.E. ; Barbe, A.; Benner, D.Chris; Bernath, P.F. ; Birk, M.; Boudon, V.; Brown, L.R. ; Campargue, A.; Champion, J.-P.; Chance, K.; Coudert, L.H. ; Dana, V.; Devi, V.M. ; Fally, S.; Flaud, J.-M.; Gamache, R.R. ; Goldman, A.; Jacquemart, D.; Kleiner, I.; Lacome, N.; Lafferty, W.J. ; Mandin, J.-Y. ; Massie, S.T. ; Mikhailenko, S.N. ; Miller, C.E. ; Moazzen-Ahmadi, N.; Naumenko, O.V. ; Nikitin, A.V. ; et al. (2009). "The HITRAN 2008 molecular spectroscopic database" (PDF). Journal of Quantitative Spectroscopy and Radiative Transfer. 100 (9–10): 533–572. Bibcode:2009JQSRT.110..533R. doi:10.1016/j.jqsrt.2009.02.013. Archived (PDF) from the original on 2015-04-03. ^ Ramanathan, V (1975). "Greenhouse Effect Due to Chlorofluorocarbons: Climatic Implications". Science, New Series. 190 (4209): 50–52. Bibcode:1975Sci...190...50R. doi:10.1126/science.190.4209.50. JSTOR 1740877. ^ a b Ramanathan, V; Y. Feng (2009). "Air pollution, greenhouse gases and climate change: Global and regional perspectives". Atmospheric Environment. 43 (1): 37–50. Bibcode:2009AtmEn..43...37R. doi:10.1016/j.atmosenv.2008.09.063. ^ Plummer LN and Busenberg E. (2006). "Chlorofluorocarbons in aquatic environments", Ch. 1, pp. 1–8. In IAEA (ed. ), Use of chlorofluorocarbons in hydrology – A guidebook Archived 2016-04-15 at the Wayback Machine: Vienna, International Atomic Energy Agency. ^ a b c Bullister, J. L.; Wisegarver, D. P. (2008). "The shipboard analysis of trace levels of sulfur hexafluoride, chlorofluorocarbon-11 and chlorofluorocarbon-12 in seawater". Deep-Sea Research Part I: Oceanographic Research Papers. 55 (8): 1063–1074. Bibcode:2008DSRI...55.1063B. doi:10.1016/j.dsr.2008.03.014. ^ Watanabe, Y. W.; Shimamoto, A.; Ono, T. (2003). "Comparison of Time-Dependent Tracer Ages in the Western North Pacific: Oceanic Background Levels of SF6, CFC-11, CFC-12 and CFC-113". Journal of Oceanography. 59 (5): 719–729. doi:10.1023/B:JOCE.0000009600.12070.1a. ^ a b c d e Fine, R. A. (2011). "Observations of CFCs and SF6 as ocean tracers" (PDF). Annual Review of Marine Science. 3 (1): 173–95. Bibcode:2011ARMS....3..173F. doi:10.1146/annurev.marine.010908.163933. PMID 21329203. Archived (PDF) from the original on 2015-02-10. ^ Warner, M. J.; Weiss, R. F. (1985). "Solubilities of chlorofluorocarbons 11 and 12 in water and seawater". Deep-Sea Research Part A: Oceanographic Research Papers. 32 (12): 1485–1497. Bibcode:1985DSRA...32.1485W. doi:10.1016/0198-0149(85)90099-8. ^ a b Min, D. H.; Warner, M. J.; Bullister, J. L. (2010). "Estimated rates of carbon tetrachloride removal in the thermocline and deep waters of the East Sea (Sea of Japan)". Marine Chemistry. 121 (1–4): 100–111. doi:10.1016/j.marchem.2010.03.008. ^ a b c Bu, X.; Warner, M. J. (1995). "Solubility of chlorofluorocarbon 113 in water and seawater". Deep-Sea Research Part I: Oceanographic Research Papers. 42 (7): 1151–1161. Bibcode:1995DSRI...42.1151B. doi:10.1016/0967-0637(95)00052-8. ^ Wanninkhof, R.; Ledwell, J. R.; Watson, A. J. (1991). "Analysis of sulfur hexafluoride in seawater". Journal of Geophysical Research. 96 (C5): 8733. Bibcode:1991JGR....96.8733W. doi:10.1029/91JC00104. ^ Bullister, J. L.; Wisegarver, D. P.; Menzia, F. A. (2002). "The solubility of sulfur hexafluoride in water and seawater". Deep-Sea Research Part I: Oceanographic Research Papers. 49 (1): 175–187. Bibcode:2002DSRI...49..175B. doi:10.1016/S0967-0637(01)00051-6. Archived from the original on 2015-09-24. ^ WHO. "Fully Halogenated Chlorofluorocarbons". International Programme on Chemical Safety. Archived from the original on 2012-05-05. Scholia has a chemical-class profile for Chlorofluorocarbon.